To evaluate a film like Delivery Man it seems one must be in tune with the career trajectory of Vince Vaughn and much like Matthew McConaughey it seems the guy has fallen into the trap of knowing what his speciality is and sticking to that comfort zone for the reason that it has worked in the past, why wouldn't it continue? Of course, if you've been paying attention to the projects McConaughey has been choosing as of late it is clear he has made some kind of decision to not only play characters who aren't the most charming or admirable guy on screen, but instead he can sometimes be the most downright despicable. Vaughn is in a slump, that is clear, but the problem is that he has been and that Delivery Man is the kind of film he thought might begin to turn that around. Hell, he probably secretly hoped that was what The Internship would do this past summer, but in a landscape of comedies where they push the envelope to the end of the world, a buddy comedy with his old friend can't even drum up enough excitement or laughs to be remembered past opening weekend. Both actors burst onto the scene in hip, independent comedies that would help them get into more mainstream projects, each of which chose more serious material and supporting roles in major blockbusters while attempting to reach that one project that would seemingly put them in the place they were destined to be. They were on a similar trajectory in any sense of the word as McConaughey finally found leading man success in 2001 and Vaughn was front and center in the now classic Old School in 2003. They were able to ride those waves of stability for the better part of the first decade of the new millenium until the well began to run dry. No one expected much from McConaughey after 2009's Ghosts of Girlfriends Past seemed to be the nail in the rom-com coffin, but a mere two years later he began to re-build. The problem with Vaughn is that he's had a number of nails, but somehow he manages to keep finding open space. There hasn't been that huge disastrous story (not counting The Watch of course, but the blame didn't fall directly on him). In any case, not since the fast-talking funnyman decided to do a pair of Christmas movies has he been able to re-claim the kind of comic credibility he had in his Dodgeball//Wedding Crasher prime. With Delivery Man he seems to at least be accepting this truth and trying to find new ground to cover while still incorporating what he is best known for. While he succeeds in proving he has the chops and charm to pull this kind of dramedy off, the film itself feels so middle of the road and inconsequential it is hard to take it as any kind of statement. 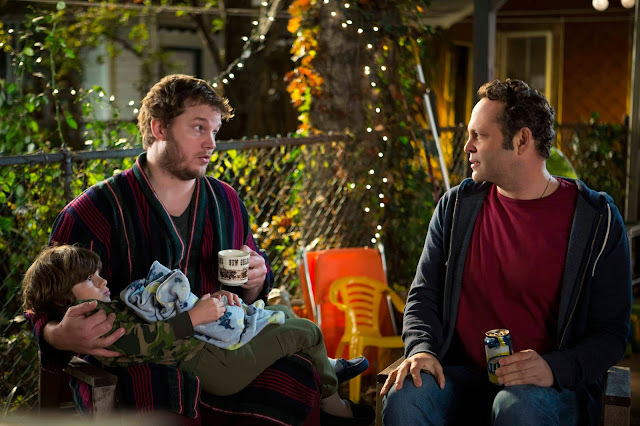 Brett (Chris Pratt) attempts to convince his friend David (Vince Vaughn) having kids is not ideal. We meet David Wozniak (Vaughn) as he goes about his day to day working at a meat market his father owns and his two brothers help run. He drives the truck to deliver (sure, why not) the meat to their customers. It is clear from the opening scenes the guy is a mess. He is in debt, trying to pay off a couple of goons that loaned him money to start growing pot (which is doing nothing but backfiring) and he has a girlfriend he doesn't give enough attention to and only shows up on her front porch at 3 am because he feels bad about not seeing, calling or texting her all day. It is when his girlfriend, Emma (Cobie Smulders), tells him the news that she is expecting and that she doesn't feel he is fit to be the child's father until he gets his act together and finds some kind of order in his life that David begins to re-think the meaning of his existence and the direction his life is heading in. Still, we see through these countless faults and understand our protagonist is a people-pleaser. He likes to make everyone around him happy, while never taking into consideration enough of his personal issues to keep his own life on track. He has faults, no doubt, but he means well and he only wants to help the ones he loves even if it isn't always apparent. David takes what Emma says with considerable weight, but it's when he comes home after their visit to a man standing in his apartment who delivers the news he has 533 children due to a mix-up at a fertility clinic he donated to over twenty years ago that he seems to find a glimmer of purpose. After consulting with his best friend and lawyer, Brett (the always hilarious Chris Pratt), he is instructed that a subset of those 500 kids have filed a lawsuit to find out who their biological father is and that it is his choice whether he wants to remain anonymous or come forward and reveal himself. Naturally, since the donations were anonymous and David signed documents stating that it was to be kept this way and only because the clinic he donated to used his sperm in ample amounts does he have this problem on his hands and have grounds to counteract the lawsuit that would likely grant him a fair amount of money. David is in need of the money, but moreso he is in need of some kind of affirmation that he's done and can do something with his life that might be for the greater good of the world and so he begins picking out profiles from the envelope of the 142 wanting to know their father and begins connecting with them one by one to see what he contributed to and how they're fairing in the world. Delivery Man is based on director Ken Scott's 2011 New Zealand film, Starbuck. He has adapted his own film for American audiences and in non-too familiar case has again directed the new version. I strayed away from seeing the original film (despite its easy accessibility on Netflix) so that I would hopefully be able to take Vaughn's vehicle on fresh terms. In that regard, I was probably more impressed with this film than those who have seen the original were and am therefore not as harsh on the reasoning for its existence, but it is a sweet tale with an interestingly high-concept to it that delivers an admirable message and there is no reason for Scott or anyone involved in the production to not want this type of story to reach as many people as it possibly can. In fact, what I enjoyed most about the film was that it has this inherent level of surprise and spontaneity because we never really know what direction things are heading in or what type of child or situation David might come up against next. There is an element of surprise to it that rather than going for the conventional situation goes for the conventional and expected theme but is able to present it in a rather amusing light that at least attempts to divert itself from the typical corniness that comes along with the messages this thing is spewing. What really allows the film these earnest and sincere qualities though is the effort put forward by Vaughn. Yes, both Smulders and Pratt get a few opportunities to flex their comedic timing and they receive their individual moments to shine, but this is Vaughn's show and he makes the most out of the material playing David as the perpetual man-child that is all of a sudden forced to grow up and take responsibilities. This has become a common theme in comedies, especially since the age of Judd Apatow began, but Vaughn has always proven to be the reliable, old-fashioned cornerstone that will stand for what his generation represents no matter how much things are changing around him. Here though, he is dating a younger woman and though his life is likely halfway over he has no sense of what he's done or what he wants to do and if there is anything specific to him that he wants to impress upon if not the world at least those around him. Still, for the children that were born as a result of his donations, it makes sense that David is as old as he is and to see Vaughn going from child to child (however creepily it might actually come off in real life) shows an ease with people, a type of pride he never knew he had and through the corn and schmaltz Vaughn is able to bring a strong authenticity. David comes face to face with a few of the 500 kids he fathered due to a mix-up at the fertility clinic. 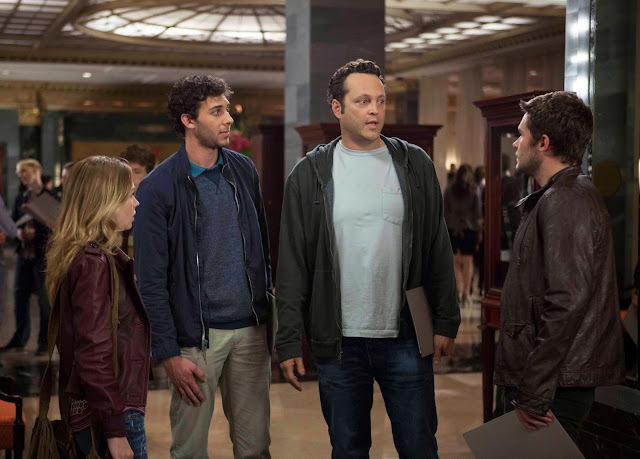 There isn't much more to be said about Delivery Man as it mainly consists of Vaughn's performance and the dynamic he shares with his co-stars as well as the ones he develops with his new-found children along the way. Britt Robertson (Dan in Real Life) and Jack Reynor (the upcoming Transformers: Age of Extinction) leave slight impressions as two of David's estranged kids given their limited screen time while Viggo (Adam Chanler-Berat) gets a whole weird section of the film that is as necessary for the progression as it is out of left field. It is always nice to see SNL's Bobby Moynihan show up in anything and he even scores some of the more instinctual and genuine laughs here, but besides the unexpected emotional resonance the film was able to strike between its dramatic elements and the less comedic side that I expected given that is how it was being marketed there was nothing too spectacular about what is going on here. The direction and soundtrack all could have been done by any number of hired hands in Los Angeles or New York and that is fine because this isn't a film where they have set out to impress you with new or innovative techniques or has the inherent drama that would no doubt be drowned out with an overbearing score were this some type of prestigious Awards-contender, but instead everything about Delivery Man feels subdued and low-key. It is and wanted to be nothing more than a little gem of a film that you may or may not come across, but will probably serve as the safe choice over the Thanksgiving holiday if the whole family isn't into animation. It delivers just enough heart, the concept alone gives way to a handful of solid laughs and the cast is all well-aware of the level at which they're playing this thing and that allows the film to settle into that nice, comfortable spot where you can find entertainment in it no matter who or where you are and not be concerned with it after you leave the theater or eject the disc. 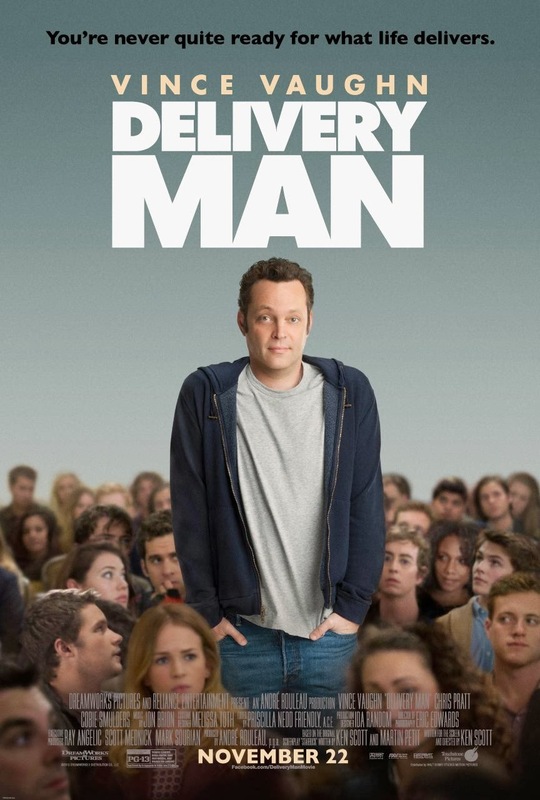 All in all, Delivery Man is a harmless if not forgettable time that is pleasant enough to not make you upset you spent money on it to see it in a theater, but the one thing of note to take away from the film is what it indicates for Vaughn's career. That he is trying, that he has taken this role he may not have thought a good fit for him before shows he is aware of that trajectory and how much it is beginning to fall. I hope he is able to do something drastic that might change his public perception (I personally think breaking from the leading roles and going for the smaller, but critical supporting ones in both comedies and other genres would be his best bet), but only time will tell if a renaissance is ready to take place or not. Delivery Man isn't a horrible step to take, but it isn't necessarily the best one he could have made either.